We all know the beautiful view from the Euromast, the highest observation tower in the Netherlands. But Rotterdam has so much more viewpoints to offer. A whole new world is hidden on top of the buildings of the city, from green rooftops to office terraces. Last summer I visited the ‘Rotterdamse Dakendagen’ festival. Here, I enjoyed the unique views of the Rotterdam skyline. Escape the city streets and pay a visit to the 5 roof terraces below! 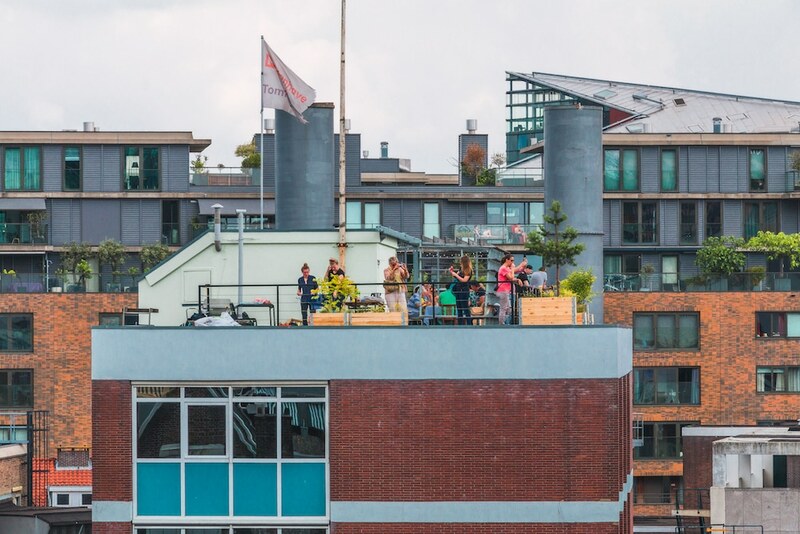 Please note: a few rooftops are not public and can only be visited during the Rotterdamse Dakendagen festival. You might already know this green rooftop/city garden, because it’s located right next to Annabel and Biergarten Rotterdam. I think this is a special piece of Rotterdam, it looks like a green courtyard, but then 20 meters in the air. 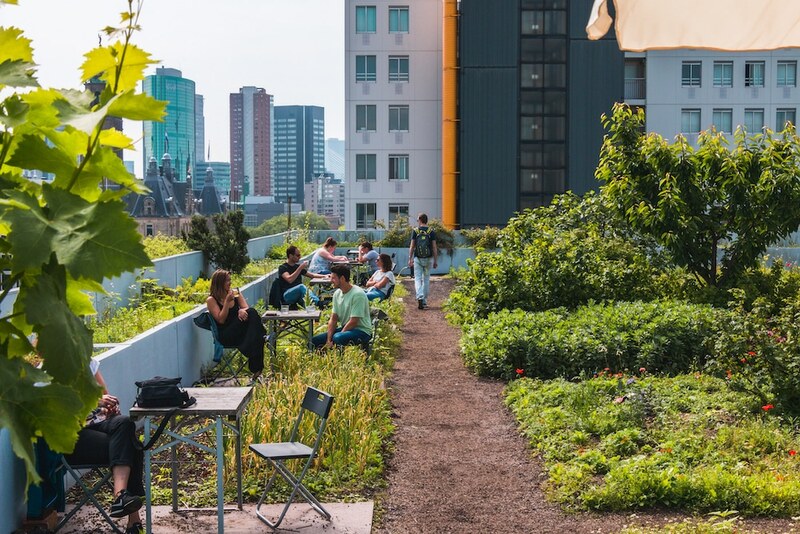 In addition, it’s the first green rooftop in the Netherlands where fruit and vegetables are grown and honey bees are kept. Follow a guided tour by the rooftop farmers with an explanation about the DakAkker. When you are done walking you can take a seat in the rooftop restaurant ‘Op het Dak‘. Enjoy a drink, a snack and a view. You won’t easily find a breathtaking 360 degree view of the entire city. This is the reason that Student Flat de Hoge Wiek is my favourite rooftop of Rotterdam. You are at eye level with the buildings, which, in my opinion, shows Rotterdam at its best. Watch how the Willemsbrug and Erasmusbrug light up slowly while the sun goes down. You have a spectacular view over the center of Rotterdam. You can easily spot the Markthal, Laurenskerk and Millennium Tower from the 17th floor. De Hoge Wiek can certainly compete with the Euromast in terms of shooting the best skyline pictures. 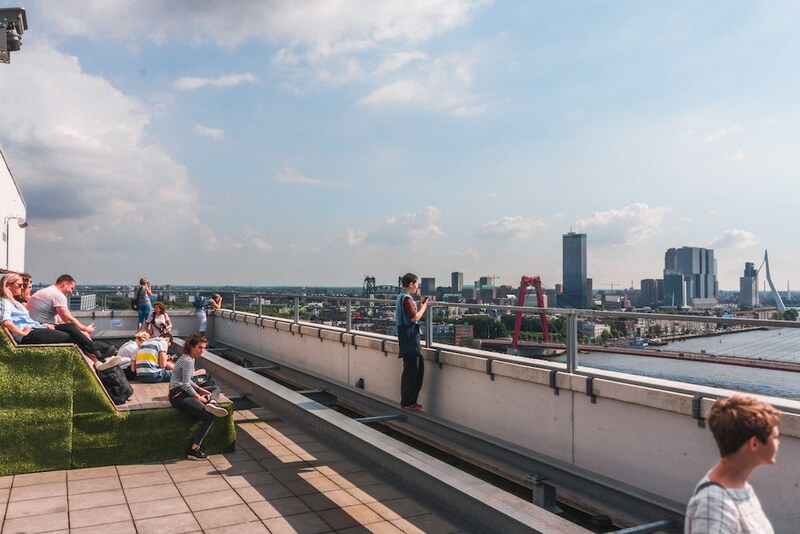 Please note: unfortunately this roof is not a public space, but you can visit it during the Rotterdam rooftop days. This former train station has been converted into a new public space: Luchtpark Hofbogen. Under this rooftop park you will find trendy restaurants, bars, shops and offices. I think it’s a nice place where you find your peace and don’t have to leave the vibrant city center at the same time. 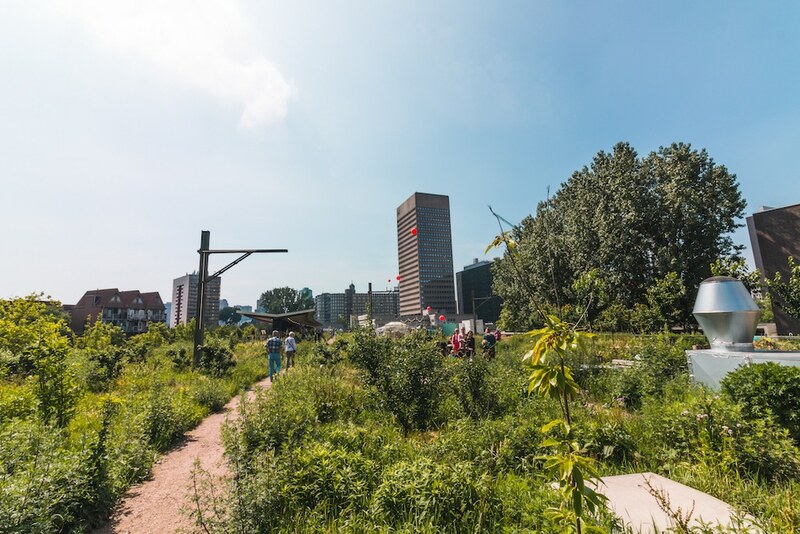 Take a walk through this green city park while being surrounded by the buildings of Rotterdam. This is the longest green rooftop in the Netherlands with a length of 1.9 kilometers. So, enough space for picnics, lounging and strolling in between the vegetable gardens and fruit trees. This cozy office terrace positively surprised me, it’s the perfect place for unique photos of the Rotterdam skyline. You won’t get bored of the 360-degree view where you look out over the Leuvehaven, Millennium Tower and more. Well-known Rotterdam buildings can be seen here from a unique perspective. Working or studying on this rooftop terrace seems very inspiring to me. 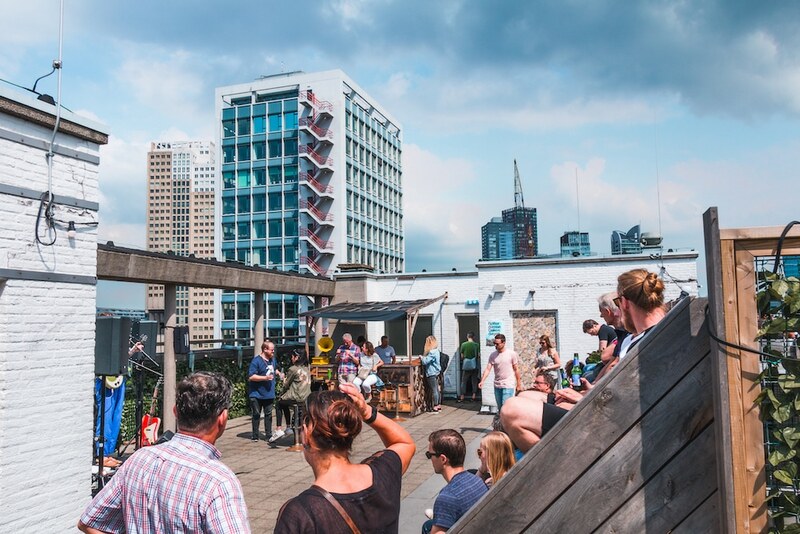 You buy a day ticket to try out the office spaces of 42WorkSpaces or visit the rooftop terrace during the Rotterdam Dakendagen. This work terrace has a beautiful view of the Grotekerkplein. You can finally view the beautiful Laurens church at eye level instead of from the ground floor. You can shoot beautiful pictures and street photos of the church and the lively square. Besides a nice view, you also have a useful work terrace with shelter from sun and wind. I already know where I am going to work in the coming summer! Please note that this is not a public space, contact the owners before you visit the terrace. Those were my favorite roofs of Rotterdam! In my previous blog you can find more hidden spots in Rotterdam. What is your favorite roof in Rotterdam? Let us know in the comments!